Hotel ibis Berlin Airport Tegel. Book online now! Free Wifi! 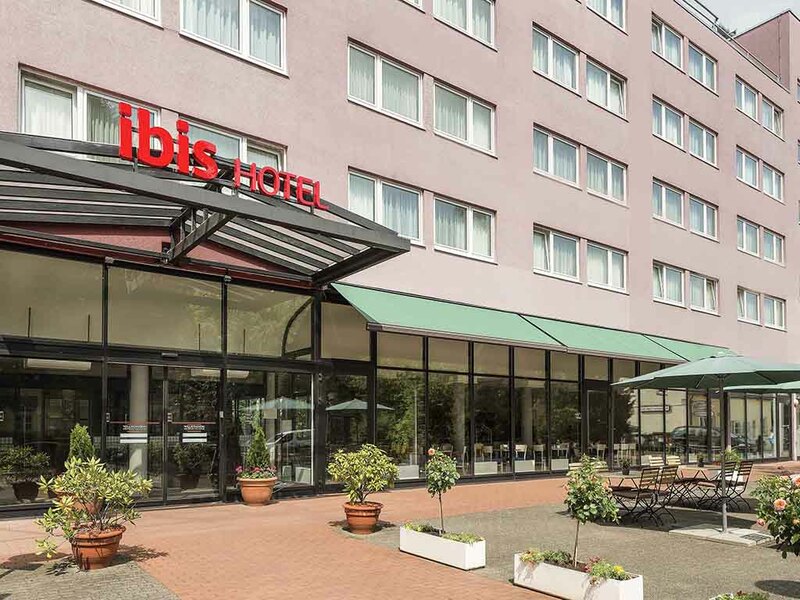 Sleep and meetings close to the airport: The ibis Berlin Airport Tegel offers good transport links to the city. The hotel is an ideal rendezvous for international meetings. As holiday-makers, you can benefit from a perfect starting point for your excursions. The center of Berlin with attractions such as the government district and museum island can be reached in around 15 minutes on the U-Bahn. All 116 rooms are equipped with free WIFI and modern equipment. Affordable car parking available. The 116 rooms at the ibis Berlin Airport Tegel delight guests with comfortable living conditions and particularly comfortable beds. You'll have no problems relaxing here. The rooms also feature a functional desk, free WIFI and cable TV. The cosy bar at the Ibis Berlin Airport Tegel Hotel features a fireplace, has enough room for 20 guests and is open 24 hours a day. You can enjoy a refreshing drink or an aromatic coffee at any time on our beautiful terrace. This hotel is really at a bad level, I will never return : - no hot water to take a shower at the morning, - no climatisation in the room, - no parking and att the end I have to pay more than reserved with credit card. We had luck the weather was not to warm so we could open the window at night. The rooms have no aairco. In the evening and morning you have the noise of the airplanes and you can not sleep with an open window. Breakfast was farely good coffee could be better. I have stayed several times at this IBIS hotel. It is a little dated but one of the best deals in Berlin. The hotel is not at the airport but not far. More important, it is five minutes from the subway. The breakfast buffet is a good deal and I am always impressed how friendly the staff is. Excellent hotel located just right for what we wanted to do in Berlin. Very helpful front desk service. We bought the buffet breakfast and it was good value. We also used the bar area one evening, also good. Overall, staff very friendly. Room was good- clean, spacious and had all amenities. However the wifi was very weak and slow and I kept losing connection. Hotel is well connected to public transport. Train and bus stops are within a few minutes walking distance. We stayed at a hotel that was easy to access a very good transport as we did not have a hire car we used buses trains underground very easy to understand a ticket costing 15.60 euros for 2 people that was valid all 3 zones.We visited the aviation museums. The hotel was clean well run friendly staff and the price included breakfast.Will be using this hotel again. The staff was nor heplful or kind. This is important for the service. I understand the culture is different among countries, however, in the hotel industry amability is a crucial part of what makes an hotel great or normal. Hotel is very clean and the staff polite and helpful. The only issue is the acoustic isolation in the rooms, you can pretty much hear everything the whole night. Good option if you're planning a short stay between flights in Tegel (which is 10 min away by car), but I'd wouldn't stay there more than one day. We would leave Berlin around 7pm. So, more than one month before our staying, I have booked and prepayed 15 Euros for a late checkout, at 5pm. When we arraived at the Ibis Tegel, we were informed that a late checkout at 5pm would not be possible. Things were not that bad because they allowed us to checkin ahead of time, around 9am, we could check out at 3pm and we were refunded in 5 Euros. Of course all of these concessions were good, but what we really wanted was the late checkout at 5pm. Besides this situation, the hotel is a good value offer and is very well located, near the UBahn station of Residenzstrasse, served by U8 line, and 30 minutes far from Tegel airpot by 128 Bus which can be taken at Franz-Neumann Platz. When is a double room not necessarily a double room? When it's at Ibis Tegel! Excellent stay at Ibis Tegel, staff very pleasant, friendly and very helpful. The hotel position is convenient for access to get to most areas within Berlin easily and quickly, either by U-Bahn or by Bus. Working with profesionals is always a pleasure. It is not usual when on the reception, in low budget hotel, at night shift, you may comunicate in 4 languages. :-) Breakfast is tatsty like homemade and room spacy and clean. The front desk was not friendly or welcoming when we arrived. We reserved two non-smoking rooms with two twin beds but they gave us two non-smoking rooms with one double bed each. Ok, for one room but not the second. Front desk seemed annoyed that we asked to switch rooms. We were then given keys to a smoking room with two twin beds put together. We pulled the beds apart the best we could but there was only one blanket. The roomed turned out to be extremely hot. The thermostat in the room controlled nothing so we ended up opening the windows, needless to say we didn't need the blanket. Nice place, everything Ibis always offers was there. Comfortable bed, nice pillows, additional blankets, but no mini bar. Wifi worked well. Location slightly disappointing, in spite of a name, approx 7 km driving. With a superb restaurant just metres from the hotel, and excellent transport links all within walking distance, this is a great proposition for a stay in Berlin. Although not centrally located, public transport works well in the city and it is not a problem to stay in the Reinickendorf area. Hotel is close from S1 & S85 and in the areas with some supermarkets and Turkish bars where you can have a good Turkish food and even cakes. Plus: good breakfasts typical for Ibis hotels across the Europe; flat tv, wifi, clean, close to public transport Minus: very often is booked out, they have occasional mix up with booking so make sure you have a printout from your booking - it is not good for the environment, but it is better to be prepared... Last time they informed me on arrival that I didn't show up the day earlier and presented my name on a printout with a few other unlucky no show up guys! They agreed finally to give me a room with no additional cost indicating that I am lucky because they had not processed the no-show up persons. Shortly after booking I checked my booking on the computer next to the main foyer and my booking on Accorhotels.com was correct! Obviously they had some mix up to which they did no want to admit :o). Staff was very nice, especially dealing with a reservation that was not processed properly. Rooms were very clean, quiet, and good sized. Breakfast was very good. Instructions to get to hotel from airport are not good. It is not close enough to be truly an airport hotel. Little restaurant in front of hotel was excellent. This Ibis hotel is located in Reinickendorf, a short bus ride (#128) or taxi ride from Berlin's Tegel Airport. While this section of Germany's capital is by no means a trendy spot, those sections of this great city are easily accessible by the excellent U-Bahn (U8). The fact that this is one of the city's quiet areas is, I think, a strong selling point. There's nothing fancy here - just a basic room simply designed and very clean - with a good bed and a more than adequate bathroom (excellent hot water shower). Breakfast is available for about 10 Euros a day per person but for those looking to save money and calories there is an excellent coffee shop/bakery just across the street from the hotel. My stay was for three-days and this hotel met my lodging needs very nicely. If you are in a vibrant city like Berlin, you really should not be spending much time in your hotel room. This Ibis facility provides a quiet, restful environment at a very good rate. We had a lovely stay in Berlin and the Ibis Hotel was good quality and very clean. The only problem was that the air conditioning wasn't working and it was very hot weather. However that was the only issue - it's in a good location close to the U Bahn and good service. If you can carry your bags in your hands, then you can travel by public transport: Take bus TXL to Berlin city. Get out at Turmstrasse and then dive down the U-bahn U9, direction Osloerstasse. Change to U8, direction Wittenau. Exit at Residentzstrasse and exit at front end of the train. Walk on main street same direction as the train and you will see the hotel at your right hand side. I think at taxi will a lot faster as the distance is just a few km. That same U8 will take you direct to Alexanderplatz, the heart of the city, which is most convenient for sightseeing. Breakfast a nice and well stocked buffet.